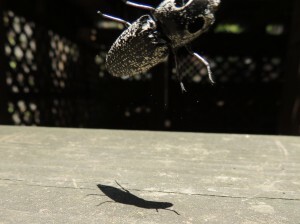 I felt like such a conservation hero one day last week when I scooped up a freaky, huge black and white beetle off a sidewalk in Prospect Park, Brooklyn. 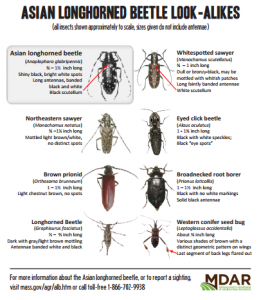 For years the city (and any group involved in trees) has been handing out pictures of the invasive beetle that has been eating maple, horsechestnut, elm, willow, birch, poplar, and ash trees trees from the inside out. I put the bug in a ziplock bag for further investigation at home. I looked him up compared to his WANTED poster. An Asian longhorned beetle (Anoplophora glabripennis) would have been quite a find in Prospect Park, which seems not to be infested yet. Luckily, it was not one.